Brian Lee, left, and Ethan Peplow, with Mid-America Sports Construction, remove the infill from the turf at Finley Stadium on March 9, 2015. The infill, which is made from tires, will be recycled. No, the new turf being installed at Finley Stadium won't be blue. But it is nearing completion. Stadium Corp. executive director Paul Smith said that the hope is to have the new turf ready to use by the 10th, the date of the University of Tennessee at Chattanooga football team's last scrimmage before the spring game on the 18th. The football field has been laid down, but Smith thought that the 10th was was going to be a "close call." 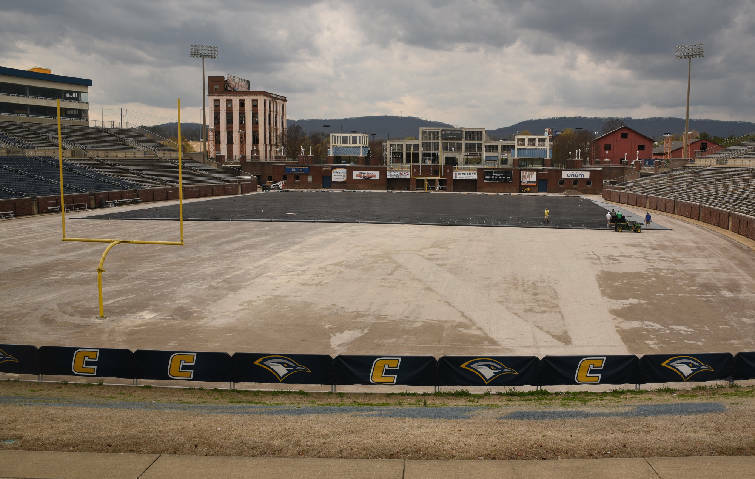 The new turf, which cost $600,000, will be the home of both the UTC football and women's soccer teams, as well as Chattanooga Football Club, the semi-professional soccer team. Not included in the field's costs are some additional equipment bought by Astroturf, the company in charge of the installation. The new turf will extend all the way to the locker room. 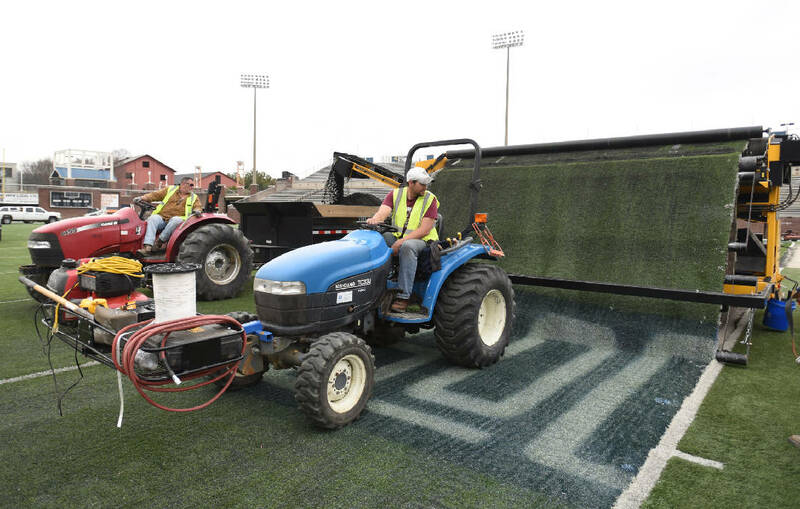 The blue "Chattanooga" that is laid out on each sideline is being removed, and the corner-kick areas in soccer have been re-leveled, to make the venue more soccer-friendly. The football lines will be removed during the summer, when the Chattanooga Football Club plays its home matches. The stadium has been a popular attraction for the Mocs' football team, as well as CFC. The football team averaged 60,879 fans on their way to a 5-1 home record, while CFC hosted five playoff games, winning all five with an average playoff attendance of 4,002 fans on their way to the National Premiere Soccer League final. CFC's home opener is scheduled for May 23rd, although they could possibly host a U.S. Open Cup match on May 13th. The UTC athletic department played an April Fools' Joke on Wednesday morning, putting out a news story with the headline "Blue Turf Install at Finley Nearing Completion." The story spoke about how the new field featured "a unique color-scheme that includes a primary blue surface with gold lines and numbers." Workers install base padding for the new football field surface at Finley Stadium on March 26, 2015. A click on a link promoting new pictures took visitors to a page featuring UTC head coach Russ Huesman and the caption "April Fools!" Defensive tackle Josh Freeman admitted that the joke fooled him. "They got me again," Freeman said. "They get me every year." Initially, the thought of playing on a blue surface -- which would have made UTC the third NCAA team to have a such-colored field, joining Boise State and NCAA Division II New Haven (Conn.) -- excited Freeman. "I was a little excited when I saw that," he said. "I looked at the story, read the article. It was pretty cool. Then I took a screenshot of the story and sent it to Kev (Nakevion Leslie) and KD (Keionta Davis), then went back and clicked on the link, and it was a picture of Coach." Both Freeman and Huesman said that the new field could breathe another level of excitement into a program that has had plenty of exciting times during the head coach's seven-year tenure. "To play on something nice is always fun," Freeman said. "It'll be an energy boost for the players." "We needed new turf," Huesman said. "It's gonna be a great surface to play on, it's gonna look great. "We're excited and can't wait to get on there next week." Contact Gene Henley at ghenley@timesfreepress.com. Follow him at twitter.com/genehenleytfp.